Coexisting Mediterranean oaks are differently predisposed to heat- and drought-induced dieback as a function of height, prior growth, wood anatomy, and growth responsiveness to temperatures. To forecast post-dieback damage, the variability of species and individual traits must be considered. Forests are susceptible to drought-induced dieback. However, considerable variability in how drought translates into tree damage exists in coexisting species. This study aimed to assess if tree size, radial growth, and wood anatomy predisposed trees to drought damage, measured as defoliation and changes in non-structural carbohydrate (NSC) concentrations. We measured radial growth, wood anatomy, and post-drought NSC concentrations in highly defoliated and less defoliated holm oak (Quercus ilex) and Portuguese oak (Quercus faginea) trees co-occurring in a coppice stand. Highly defoliated trees showed a lower height than less defoliated individuals. In holm oak, a reduced previous growth and the formation of vessels with smaller lumen areas predisposed to drought damage, which suggests hydraulic deterioration. In Portuguese oak, most defoliated trees grew less in response to elevated growing season temperatures. Sapwood starch and NSC concentrations decrease in defoliated holm oaks. A height-dependent predisposition modulates the responses to drought-induced dieback in Mediterranean oak coppices. Coexisting oak species presented different predisposing factors to drought-induced dieback related to growth (holm oak) and its sensitivity to temperature (Portuguese oak). To forecast post-dieback damage, we should consider the variability of traits between and within species. G. Sangüesa-Barreda and J.J. Camarero performed field sampling. M. Vergarechea and J.J. Camarero carried out the anatomical and statistical analyses, respectively. J.J. Camarero led the writing of the paper, and all authors contributed to the discussion. The online version of this article (doi: 10.1007/s13595-015-0523-4) contains supplementary material, which is available to authorized users. Globally, most forests are at risk of hydraulic dysfunction when there is a significant soil water deficit (Choat et al. 2012). Drought-induced dieback, usually manifested as foliage loss and growth decline, is a secondary manifestation of the dysfunctions in hydraulic tree systems (Allen et al. 2010). However, considerable variability in the vulnerability to cavitation due to drought stress exists among coexisting species and individuals (Meinzer et al. 2009; Nardini et al. 2013). The varied responses of tree species to drought have been linked to the variability of hydraulic traits such as the water potential at which 50 % of hydraulic conductivity is lost (Anderegg 2015). Nevertheless, growth seasonality could also determine how soil moisture deficit is translated into tree damage (Anderegg et al. 2013). Two physiological mechanisms, which are not mutually exclusive, have been posed to explain forest dieback: hydraulic failure caused by embolism-induced loss of conductance and carbon starvation due to prolonged stomatal closure (McDowell et al. 2008; Sevanto et al. 2014; Sperry and Love 2015). Disentangling the role played by each mechanism is a challenge since droughts not only reduce growth, photosynthesis, and respiration (Hsiao 1973) but also uncouple carbon sinks (growth) from sources (photosynthesis) (Muller et al. 2011). In fact, under moderate water deficits, this uncoupling should lead to increasing concentrations of non-structural carbohydrates (NSC henceforth) in tree tissues (Tardieu et al. 2011). 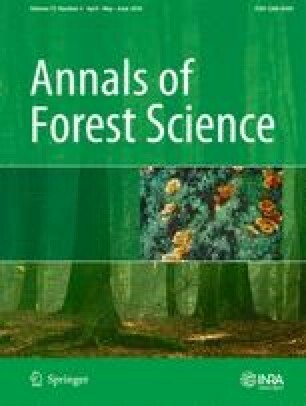 The relative importance of hydraulic failure vs. carbon starvation as drivers of forest dieback also depends on interrelated traits (height, leaf phenology, wood density and anatomy, NSC concentrations, anisohydric vs. isohydric behavior) affecting hydraulic conductance, carbon use, or growth (Hoffmann et al. 2011; Sala et al. 2012). Forest dieback typically occurs in response to rare, extreme, and unpredictable climatic events such as droughts (Gutschick and BassiriRad 2003), which often precludes monitoring trees before and after the dieback occurs. The opportunistic nature of observational studies can be balanced by following a retrospective approach based on tree ring data. This allows comparing growth and wood anatomy between trees showing different sensitivity to drought and contrasting defoliation degrees. Here, we follow this approach by analyzing the responses of two Mediterranean oak species (holm oak, Portuguese oak) to the exceptionally warm and dry 2012 year which caused widespread forest dieback in eastern Spain (Camarero et al. 2015). The holm oak (Quercus ilex subsp. ballota (Desf.) Samp L.) is an evergreen species which usually retains up to 3-year-old leaves and forms diffuse to semi-ring porous wood (Montserrat-Martí et al. 2009; Campelo et al. 2010). It is dominant in areas of the Iberian Peninsula subjected to continental Mediterranean climate, where it withstands dry and cold conditions (Peguero-Pina et al. 2014). The Portuguese oak (Quercus faginea Lam.) is a winter deciduous species forming ring-porous wood, and it usually coexists with holm oak but dominates mesic sites with basic soils under sub-Mediterranean conditions. However, the Portuguese oak shows an earlier phenological development (most primary and secondary growth occur in spring) than holm oak which is able to grow during summer (Montserrat-Martí et al. 2009; Albuixech et al. 2012). This is also reflected in the radial growth responses to climate, since tree ring width usually increases in response to wet spring or summer conditions in the case of Portuguese and holm oaks, respectively (Corcuera et al. 2004a, 2004b; Gutiérrez et al. 2011). From an ecophysiological point of view, the holm oak is a drought-tolerant species displaying a tight stomatal control over transpiration, while Mediterranean oak species similar to Portuguese oak show a higher conductance but also experience xylem embolism due to summer drought and freeze–thaw events in winter (Tognetti et al. 1998). We take advantage of the extreme 2012 drought (i) to detect predisposing factors to dieback damage related to prior differences in size, growth, and wood anatomy and (ii) to determine if those variables affect post-drought responses. Specifically, we analyze the relationships between climate and previous radial increment and wood anatomy and assess if post-drought defoliation and tissue or organ (leaf, shoot, sapwood) NSC concentrations are related. We expect that the species presenting an earlier growing season in spring (Portuguese oak) will be more negatively affected by warm and dry conditions during that season than the species better adapted to withstand summer drought (holm oak). We also hypothesize that highly defoliated holm oak trees will show accumulated drought damage in terms of growth and wood anatomy because they have to rebuild the whole canopy using carbon stored in the wood. Contrastingly, this is the usual situation for the Portuguese oak whose rapid bud burst and earlywood formation should make it more dependent on stored NSCs synthesized in the previous growing season (Barbaroux and Bréda 2002). Improving our knowledge on factors predisposing trees to dieback would help to better forecast which will be the most vulnerable forests in response to warmer and drier conditions (Bréda et al. 2006), particularly in Mediterranean areas where more extreme droughts are predicted to occur (IPCC 2014). In summer 2013, we selected a mixed oak coppice stand affected by the 2012 drought and situated near Formiche Bajo, eastern Spain (40° 18′ 02″ N, 0° 52′ 14″ W, 1,120–1,150 m asl; Supplementary Material, S1). The stand is located on SW-oriented steep slope. The holm oak is the dominant tree species (basal area of 13.8 m2 ha−1, mean density of 1,850 stems ha−1) followed by the Portuguese oak (basal area of 5.1 m2 ha−1, mean density of 825 stems ha−1), and there are also scattered individuals of Juniperus thurifera L. and Juniperus oxycedrus L. The soils are basic and rocky; they mainly belong to the Cambisol type. In the site, trees were coppiced every 20–25 years, but it has not been managed since the 1980s. Holm oak is able to resprout from stump and root, but Portuguese oak only resprouts from the stump (Serrada et al. 1992). We found no evidence of recent fires (scars, charcoal) affecting the study site. According to climatic data (period 1960–2013) taken from the Teruel station (40° 21′ 02″ N, 1° 07′ 27″ W, 900 m asl. ; located at about 25 km from the study site), the mean annual temperature in the area was 12.1 °C, and the total annual precipitation was 380 mm. The warmest and coldest months were July and January, respectively, with mean maximum and minimum temperatures of 31.1 and −2.4 °C, respectively. The rainiest and driest months were May and February with 54 and 16 mm of total precipitation, respectively. Frosts were frequent from November to March (Supplementary Material, Fig. S2). To quantify water deficit, we calculated the monthly water balance as the difference between precipitation and potential evapotranspiration (PET), and monthly PET was estimated using monthly temperature and radiation values following Hargreaves and Samani (1982). In the study area, the mean cumulative annual water balance was −848 mm. The months with the lowest and highest water balance were July (−176 mm) and December (−8 mm), respectively. The minimum water balance is usually observed in July (Supplementary Material, Fig. S2). To estimate the effect of drought intensity and duration on radial growth, we used the Standardized Precipitation–Evapotranspiration Index (SPEI), which is a multi-scalar drought index integrating the effects of temperature and evapotranspiration on the water balance (Vicente-Serrano et al. 2010). The SPEI varies from negative to positive values corresponding to dry and wet periods, respectively. The SPEI monthly values were calculated for the study site considering the period 1960–2013 and 1–18-month-long scales following Camarero et al. (2015). The SPEI accounts for the negative effect of warmer temperatures on water availability by statistically modeling cumulative water balances. Therefore, different SPEIs are obtained for different time scales representing the cumulative water balance over the previous n months (Vicente-Serrano et al. 2010). From May to August 2013, we established a 500-m-long transect running parallel to the maximum slope in an area widely affected by the 2012 drought showing defoliation and abundant dead shoots, leaves, and branches (Supplementary Material, Fig. S1). Every 10 m along the transect, we tagged, measured (diameter at 1.3 m of all stems, maximum tree height, number of stems), and sampled the holm oak (n = 50 trees) or Portuguese oaks (n = 25 trees) located closest to that point. All sampled stems were growing from ageing stools. Defoliation in response to the 2012 drought was regarded as a proxy of tree vigor since changes in crown cover induced by heat and drought stress correspond to modifications in hydraulic conductance and radial growth (Dobbertin 2005; Camarero et al. 2015). For each sampled tree, the proportion of crown cover was estimated to the nearest 5 % (Schomaker et al. 2007). Since estimations of crown cover vary among observers and places, the data were always recorded by the first author, who compared every tree with a reference tree with the maximum amount of foliage at each site. Low-defoliation trees were considered those with a crown cover of >50 % and high-defoliation trees those showing cover ≤50 % (Camarero et al. 2015). Other classification types of vitality based on different crown cover thresholds (40–60 %) produced similar results as those here presented. Besides, a crown transparency threshold higher than 50 % usually represents weakened trees due to drought-induced defoliation (Eilmann et al. 2013). where r t and r t − 1 are the radii corresponding to rings formed in years t and t − 1, respectively. We used BAI because this variable is linked to variations in hydraulic conductance in Mediterranean oak trees (Cherubini et al. 2003). To analyze wood anatomy, we selected ten trees per species, five per each defoliation class, showing well-cross-dated series and half of them corresponding to high- or low-defoliation levels. We analyzed the rings formed in the 1990–2013 period which includes several dry (e.g., 1994–1995, 2005) or wet years (1997) potentially affecting the long-term hydraulic performance of trees (Corcuera et al. 2004a). We selected 2013 as the last ring of analyses because this was the last ring formed in several highly defoliated trees (holm oak, three trees; Portuguese oak, two trees). Since we were concerned on drought-related loss in hydraulic conductance, only the earliest formed vessels holding most of the ring conductance were analyzed, i.e., the earlywood vessels in Portuguese oak (vessels with ample lumen areas forming the first two to three lines of cells; cf. Alla and Camarero 2012) and vessels located in the first half of the ring in holm oak. A 10-mm-wide strip was cut from each disk encompassing the rings formed in the period 1990–2013. Then, a core microtome was used for surface preparation of each oak sample, after which a combination of black staining and white chalk was utilized for contrast enhancement. To perform cell anatomical surveys, digital images of each ring were captured using a digital video camera (Leica DFC 290) connected to a light microscope (Olympus BH2) at ×12.5–20.5 magnification and ca. 9,100 dpi image resolution. Adjacent images were taken for each ring, merged, and then transformed into black and white images. For each selected ring, the considered xylem area and the lumen transversal area of each vessel were measured using the image analysis program ImageJ (Abramoff et al. 2004). Lastly, we determined how vessels were distributed according to their lumen area and calculated the mean vessel area for the period 1990–2013 considering each defoliation class. We assessed how drought-induced defoliation affected NSC concentrations in the stem sapwood, shoots, and leaves (Barbaroux and Bréda 2002; Hoch et al. 2003). We randomly selected ten individuals in each of the two defoliation classes for the two oak species. Sampling was carried out in November 2013 at the end of growing season and in July 2014 when leaves of both oak species were fully developed. In each individual, we sampled the most recently formed shoots and leaves from upper and light-exposed branches. We also sampled the sapwood from the thickest stem of each individual by taking two radial cores at 0.5 m using a Pressler increment borer. Since bud bursting in 2014 did not occur in most holm oak trees, we assumed that the most recently formed shoots and leaves corresponded to the 2013 cohort. In the Portuguese oak, the leaf and shoot samples of highly defoliated trees usually corresponded to epicormic shoots. All samples were collected between 10 and 12 h. Samples were transported to the laboratory in a portable cooler. Shoots and leaves were dried in the oven at 60 °C for 72 h. The outer sapwood portion (ca. 5 cm) was visually recognized and separated from each core using a razor blade. Wood samples were subsequently frozen and stored at −20 °C until freeze dried. All dried samples were weighted and milled to a fine powder in a ball mill (Retsch Mixer MM301, Leeds, UK). Soluble sugars (SS) were extracted with 80 % (v/v) ethanol and their concentration determined colorimetrically using the phenol-sulfuric method (Buysse and Merckx 1993). Starch and complex sugars remaining after ethanol extractions were enzymatically reduced. NSCs measured after ethanol extraction are referred to as SS, and carbohydrates measured after enzymatic digestion are referred to as starch. The sum of SS and starch is NSC. Trends in monthly climate variables during the period 1960–2013 were analyzed using the Kendall tau coefficient (τ). Comparisons of variables between defoliation classes and within each species were assessed using the Mann-Whitney U test. The relationships between tree variables were assessed using the Spearman non-parametric correlation coefficient (r s). To compare how BAI changed through time between defoliation classes, we applied linear mixed-effects models after log-transforming BAI values. Finally, the distributions of vessels based on their lumen area were compared between defoliation classes using χ 2 tests. The climate–growth relationships were analyzed by relating BAI individual series to monthly climatic variables (mean maximum and minimum temperatures, precipitation, water balance) separately for each defoliation class and using the Pearson coefficient. These correlations were calculated from previous October to current September, i.e., during the year of tree-ring formation, based on previous analyses of xylem phenology (Corcuera et al. 2004b; Albuixech et al. 2012). The BAI mean series were correlated to the SPEI obtained for 1- to 18-month-long scales (Pasho et al. 2011). To account for the effects of temporal autocorrelation on these correlations, we corrected the probability levels following Mudelsee (2003). All statistical analyses were done using the R statistical software (R Core Team 2015). June to August temperatures have significantly risen in the study area (P < 0.005), particularly considering maximum or daily temperatures (mean τ = 0.42). The 2012 drought was characterized by very warm temperatures and dry conditions in May and August (Supplementary Material, Fig. S2). In May 2012, the water balance reached a minimum record of −163 mm (Fig. 1). In summer 2014, holm oaks did not produce new shoots since apical buds were dead, whereas highly defoliated Portuguese oaks only formed epicormic shoots. Highly defoliated trees were smaller than less defoliated individuals (Table 1). Less defoliated holm oak trees grew significantly more during the 1960–2013 period than highly defoliated trees (defoliation effect, F = 47.96, P < 0.001; year × defoliation effect, F = 8.13, P = 0.004; Fig. 1). These differences were more noticeable during wet years (late 1970s, 1997, 2003, and 2007). In Portuguese oak, highly defoliated trees grew more than non-defoliated trees in the 1960s and early 1970s, but this trend reversed in the 2000s, this reversal being more obvious after the late 2000s (defoliation effect, F = 1.07, P = 0.30; year × defoliation effect, F = 9.11, P = 0.003). The lower average growth rate but higher mean sensitivity (MS x ) of Portuguese oak as compared with holm oak suggests that the former species was more responsive to water deficit during the growing season than the latter (Table 2). This corresponded to the high BAI-SPEI correlations observed in Portuguese oak which peaked in June at 11–month-long SPEI time scales (r = 0.69), whereas in holm oak, they did it (r = 0.56) in July at the 4-month scale (Fig. 2). In addition, BAI of Portuguese oak was enhanced by wet April to June conditions and also by low maximum temperatures in March and late summer (July to August) (Fig. 3). In holm oak, warmer conditions in February and wet and cool conditions in April–May and August enhanced BAI. Highly defoliated Portuguese oak trees were significantly more responsive to the negative effects of warmer maximum temperatures on BAI in spring and summer (March, July, and August) than less defoliated trees (Fig. 3). A similar pattern was observed in holm oak for the maximum temperatures from May to August, albeit in this species warmer spring-to-summer temperatures were not as significantly associated to decreased BAI as in Portuguese oak. Specifically, in Portuguese, oak defoliation was negatively related to the BAI response to July maximum temperatures (r s = −0.49, P = 0.005, n = 16). In the case of holm oak, the higher the defoliation the most negative was the BAI association to June maximum temperatures (r s = −0.34, P = 0.02, n = 31). In holm oak, highly defoliated trees formed more vessels with small transversal areas than less defoliated trees (χ 2 = 35.4, P < 0.001), whereas this trend reversed in highly defoliated Portuguese oaks which formed wider earlywood vessels (χ 2 = 57.4, P < 0.001; Fig. 4a). Accordingly, higher average vessel areas were observed in less defoliated holm oak (mean ± SE = 4.03 ± 0.15 × 103 μm2) than in highly defoliated (3.25 ± 0.10 × 103 μm2) trees (Mann-Whitney U = 3355, P = 0.0004; Fig. 4b). In Portuguese oak, more defoliated trees showed a higher mean earlywood vessel area (22.5 ± 0.55 × 103 μm2) as compared with less defoliated trees (20.5 ± 0.46 × 103 μm2), and the difference was significant (Mann-Whitney U = 2364, P = 0.037). Highly defoliated holm oak trees presented lowest starch and NSC concentrations than less defoliated trees in summer 2014 (Table 3). Defoliation of holm oak trees was negatively related to their sapwood starch concentration (r s = −0.84, P < 0.001). Several factors (height, prior growth, and wood anatomy) predisposed to drought-induced dieback in the two studied Mediterranean oak species. As expected, the most defoliated holm oak individuals showed lower growth rates and vessels with smaller transversal areas than less defoliated trees prior to the dieback (Figs. 1 and 4). However, in Portuguese oak, the differences in growth (BAI) between defoliation classes appeared after the 2000s recurrent droughts, and more defoliated trees showed a slightly higher mean earlywood vessel area. Holm oak trees showing lower growth rates and producing vessels with smaller areas were more prone to drought-induced leaf shedding and dieback. Our findings partially coincide with results obtained from rainfall exclusions showing how drought precludes shoot extension and reduces leaf production in this species (Ogaya and Peñuelas 2006; Limousin et al. 2010; Misson et al. 2011). However, these exclusions did not usually alter xylem vessel area. Therefore, changes in the transpiring leaf area seem to be a fast morphological adjustment adopted to cope with the increased transpiration demand. In the field, intense droughts are associated to reduced growth and the formation of narrow vessels in holm oak (Corcuera et al. 2004a) and other Mediterranean oak species (Corcuera et al. 2004b; Gea-Izquierdo et al. 2012). These modifications in wood anatomical features suggest that intense or long-lasting droughts modify wood formation and probably make affected trees less resilient after the drought ceases, whereas defoliation is a more rapid response to water shortage (Eilmann et al. 2013). Overall, wood anatomy and growth data suggest that a long-term hydraulic deterioration influenced the defoliation and dieback intensity observed in holm oak. Portuguese oak trees grew at high rates and were characterized by being very responsive to the water balance and forming wide conduits. Fast-growing trees located in xeric sites depend on fluctuating soil water sources (Bendixsen et al. 2015), but the soils in the study site were rocky and shallow which suggests Portuguese oak should reach accessible soil reserves. In fact, the Portuguese oak is able to hold higher soil water contents in the upper layers under its canopy than the holm oak (Coll et al. 2012). In this species, more defoliated trees showed a slightly higher mean earlywood vessel area but presented lower growth rates since the 2000s, when severe droughts became frequent. The deciduousness and ring-porous wood type of this species make it more dependent on previous winter and spring growth conditions (Alla and Camarero 2012). Therefore, different shoot and leaf phenologies between the two compared oak species could explain these results since primary growth in Portuguese oak exclusively relies on 1-year-old buds, whereas the holm oak is able to “store” viable buds up to 4 years (Alla et al. 2013). This implies that Portuguese oak must rely on keeping viable buds during winter or forming epicormic shoots to restore the canopy after droughts, whereas the holm oak could form new shoots from older buds. Warm and dry conditions in spring and summer were associated to reduced growth (Fig. 2), but such reduction intensified as defoliation increased in both tree species, being significant only in the Portuguese oak (Fig. 3). This is in agreement with the most pronounced seasonal responses to climatic stressors of deciduous tree species in forests subjected to continental and Mediterranean conditions (Granda et al. 2014). Growth in the deciduous oak species responded more negatively to spring heat stress, and this translated into increased defoliation and growth decline but not into NSC depletion. This heat stress may act by amplifying summer drought stress thus reducing earlywood formation. A common feature observed in highly defoliated trees was their smaller height as compared with less defoliated individuals. However, the study site is a low coppice stand so any explanation related to hydraulic limits imposed by tree height is not plausible (cf. Ryan and Yoder 1997). In the Mediterranean Basin, resprouting oak species have been usually managed as coppice systems (Serrada et al. 1992). Coppice oak stands accumulate a belowground biomass greater or equal than that displayed aboveground due to root and stump resprouting (Canadell and Rodà 1991). We suggest that the imbalanced root/shoot ratios of coppice oaks could magnify the competition for water within the stools of the same individual making higher individuals more prone to drought-induced defoliation (Corcuera et al. 2006). Thus, previous forest use can predispose to drought-induced dieback by affecting aboveground productivity in coppice oaks. In Norway spruce trees subjected to an experimental drought, only root carbon pools were reduced when trees died (Hartmann et al. 2013). Hence, sampling root systems could be further considered in future research to test if the decline in sapwood starch observed in highly defoliated holm oaks corresponds to a reduction of belowground carbon pools. In addition, the reported defoliation-height association should be further tested in more coppice oak species where detailed analyses of the actual soil water available to trees at different depths are urgently needed. To conclude, coexisting oak species were differently predisposed to drought and heat stress as a function of prior growth (tree height, wood formation) and vessel lumen area. In both oak species, defoliation increased as prior tree height decreased, i.e., we detected a size-dependent predisposition to dieback. The reduced growth and vessel area prior to dieback of highly defoliated holm oak trees indicate that in this species, slow-growing trees are more prone to post-dieback defoliation and a decrease in the sapwood starch concentration. Contrastingly, in the Portuguese oak, the most predisposed trees to drought-related defoliation showed the highest growth responsiveness to warm spring and summer temperatures, i.e., they were particularly sensitive to elevated evapotranspiration rates during the growing season which reduced radial growth. These findings emphasize the role played by species and individual-specific traits as predisposing factors to drought-induced dieback. Traits such as growth seasonality, tree size, growth rate and responsiveness to climate, and xylem vessel area filter how soil moisture deficit translates into drought damage in trees. We sincerely thank E. Lahoz and M. Maestro for their help with chemical analyses. We thank R. Hernández and Formiche forest guards (Aragón Government) for their guidance in the field and elsewhere. We acknowledge collaborative work and discussions supported by the Studying Tree Responses to extreme Events: a SynthesiS (STReESS) EU COST Action FP1106. This project was supported by project CGL2011-26654 (Economy and Innovation Ministry, Spain). R Development Core Team (2015) R: a language and environment for statistical computing. R Foundation for Statistical Computing, Vienna, Austria. http://www.R-project.org.